In the game, the player controls a lone protagonist, the Guardian, who is on a quest to destroy a large alien-infested world named Naju before it reaches the planet Earth. The player must deactivate ten safety devices scattered throughout Naju, thus activating the alien world's self-destruct sequence. The player explores Naju in a non-linear fashion and can acquire different weapons during the course of the game. Gameplay varies depending on the player's location within Naju. The player controls the Guardian in humanoid form when exploring the surface of Naju (the Labyrinth) and in spaceship form when investigating Naju's interior (the Dungeon). The Guardian has a life meter that decreases after sustaining damage from enemies; it can be replenished by collecting various items. If the life meter runs out, the Guardian explodes, and the game ends. The player can use a primary rapid-fire weapon with unlimited ammunition as well as various powerful secondary weapons that consume "power chips" with each use. Power chips are also used as currency to purchase upgrades for the Guardian in a handful of shops throughout Naju. Found within the Labyrinth or obtained after defeating a boss, these upgrades include primary weapon improvements, new or upgraded secondary weapons, and round, brightly colored creatures called Landers. 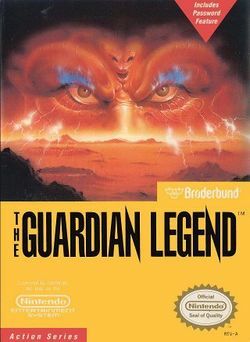 In The Guardian Legend, the player controls the female guardian of Earth, a "highly sophisticated aerobot transformer". The player's mission is to infiltrate Naju, a large planet-like object which aliens sent hurtling towards the Earth. While inside, the player must activate ten safety devices in order to initialize Naju's self-destruct mechanism and destroy the alien world before it reaches Earth. Five hostile tribes of alien lifeforms are vie for control of territories within Naju, and the player needs to fight through them to successfully activate the switches and escape. The story is advanced through a series of messages left by one or more unidentified predecessor(s) who unsuccessfully attempted to engage the self-destruct mechanism of Naju before the Guardian arrived. Left by the sole remaining survivor of the attack on Naju, the first message serves as an introduction; later messages give hints that help the player open locked corridors. This page was last edited on 25 January 2012, at 19:01.